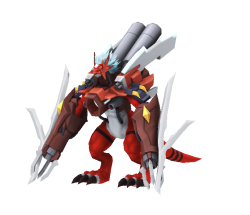 WarGrowlmon X is an altered version of WarGrowlmon that carries the X-Antibody Factor : WarGrowlmon in its Digicore. WarGrowlmon X is a Cyborg Digimon and carrier of the X Antibody, It gained the ability to change the extraordinary power of the "Digital Hazard" contained within its body into a variety of energy shots and fire them from the attack units on each part of it, and is called the "Deep-crimson Heavy Tank". During close-combat, it performs its "Double Edge Σ" with the "Pendulum Blades Σ", and its Special Move "Atomic Blaster" is fired via the gunports on its chest and arms with four times the power. The huge gunport on its chest is a cannon for its "Atomic Megalo Blaster". Double Edge Sigma Fire attribute 6 seconds cooldown 89 DS consumed 2 skill points per upgrade Learned at Lv. Atomic Megalo Blaster Fire attribute 10 seconds cooldown 221 DS consumed 3 skill points per upgrade Learned at Lv.